I love cashmere..It is so soft and comfortable, and it keeps you cosy and warm in any weather! It is one of the world’s most rare and valuable fibres which is combed twice a year from the fleece of the cashmere goat and is highly prized by textile and knitwear producers for its softness and sheer luxury. But there is one problem with it – everyone associates it with the winter! So is it still a good idea to wear it in the summer days? Well.. as you probably know, the summer in the UK is not like the summer in mainland Europe. We do have our HOT days occasionally (just like last week), but here it’s always a good idea to take a vest with you when leaving the house. So for this week’s look, I decided to show you that wearing cashmere can be a really good idea even in the summer days. I got my beautiful cashmere vest from Dunedin Cashmere – a traditional Scottish Cashmere shop, based just outside the Edinburgh castle! Their products are made of finest materials, and as you can see from the design of this vest, they are made by people with real passion for clothing. 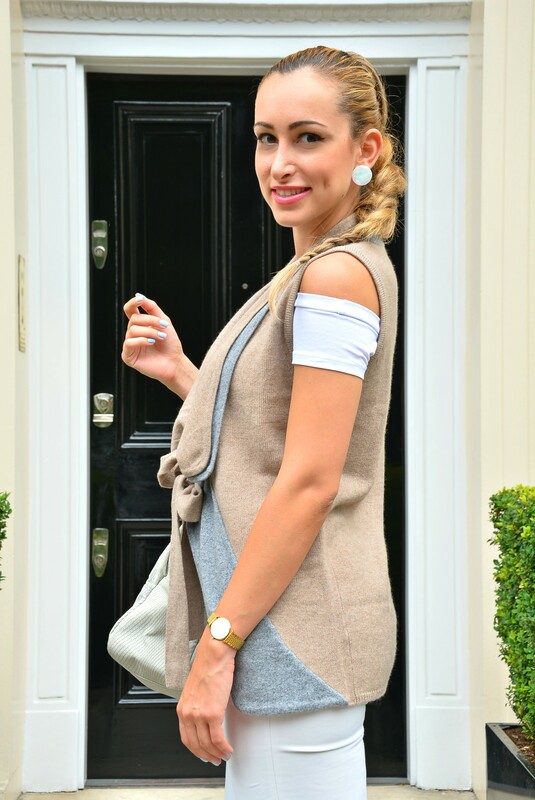 As the vest has a very simple & classy design it is the perfect finish to your look for every occasion and can be combined with lots of different outfits. I decided to combine it with white trousers and white top (a typical summer outfit), and to make it even more summery I wore white wedges. I used a sporty Armani Jeans bag in grey, as the colour is in between the grey of the vest and the white of the trousers. It also makes the look more casual. I chose Regent’s Park for the shoot as it is one of my favourite places, especially in the summer. It is part of the Royal Parks and is known as the ‘jewel in the crown’. In my opinion, it is the best park in London! Regent’s Park is a great place for a stroll on the weekend and I also love the architecture of the houses in that area. The Park Crescent, designed by John Nash is probably one of the most famous buildings near Regent’s Park. It consists of elegant stuccoed terraced houses and forms a semicircle. So, if you haven’t been in the area, do not forget to visit next time you are in London. For more great pieces of their luxurious cashmere collection visit dunedincashmere.co.uk.